Hay Bro Sis...One of the giant car manufacturers in Indonesia, PT Toyota Motor Manufacturing Indonesia (TMMIN) has just announced in the period January to August 2015, TMMIN has managed to increase the number of vehicles with the system of export CBU (Completely Built Up) through the brand Toyota. In the first eight months of 2015, the number of Toyota cars export to various countries has already reached 122,000 units or 70 percent of the target of one year, where Toyota is targeting exports of cars in the amount of 175.00 units for 2015. This was revealed directly by representatives of Toyota Indonesia to the media. "Until now our export performance in accordance with the plan. We expect, in the next four months of this performance can be maintained, so that the target can be achieved in line with expectations, "said I Made Agile Fund as Director of Corporate and External Relations TMMIN, quoted from Autocar Indonesia, Wednesday (30/09/2015). When you see the number of sales abroad has been done by TMMIN through CBU export volume in the period January to August 2015, means that export sales for Toyota increased volume of vehicles for export, about 25 per cent from the previous corresponding period January to August 2015. Where at that time, TMMIN only managed to record the number of vehicle exports of 97,000 units for the first eight months of 2014. "We are grateful to the entire supply chain, especially the suppliers who have helped to achieve this export. Without the synergy chained Toyota Indonesia and group operation, then the good export performance can not be realized properly, "added Made Dana. Then the car what most contributors export to Toyota? 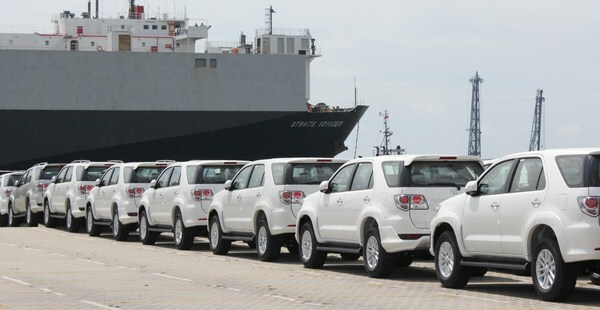 Based on export data from TMMIN, Toyota's flagship SUV, the Fortuner become the most exported car with the number of shipments for the global market reached 34,000 units. For second place there sedan Vios that has recorded export volume of 33,000 units, and in third place are Kijang Innova MPV which contributed sales of 12,000 units. For other models such as Avanza, Town Ace / Town Lite, Agya, Rush, and Yaris also has recorded export volume as much as 43,000 units.